StoneCraft is a long-lasting manufactured veneer that can beautify your home and add value as well. Available in a variety of colors and contours, StoneCraft offers the texture and dimension of real stone for both inside and outside walls. With just a few tools, the veneer can be installed directly over wood, concrete block or unsealed brick; with the addition of a weather-resistant vapor barrier, it can also be installed over wallboard or other materials. Correct installation is important, so you should consult your local dealer for the best approach to your own particular project. 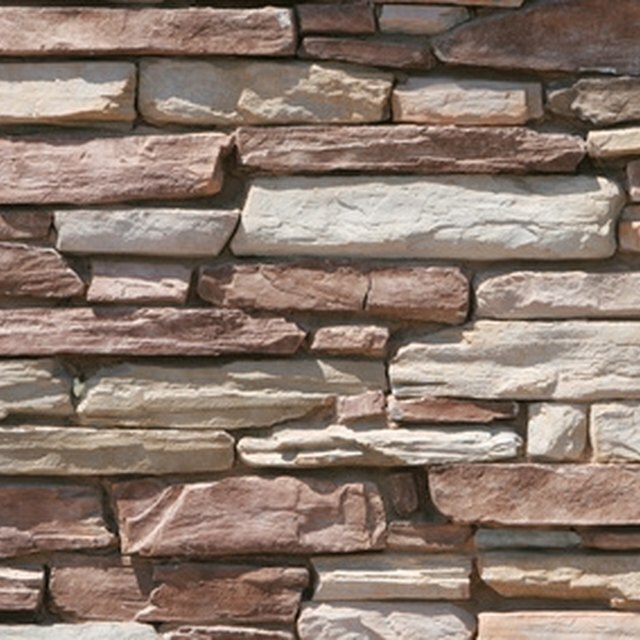 When installed correctly, manufactured stone veneer looks like the real thing. Apply 15-lb. felt paper or other weather-resistant vapor barrier to your wall using ½-inch galvanized roofing nails, or staple the vapor barrier to the wall with a staple gun. Find studs with a stud finder and mark them. Install a metal lath (a metal mesh that will provide a base for the mortar) to the surface, affixing it with 1.5-inch galvanized roofing nails or stapling it with a staple gun. If you have steel studs, use a power drill or screwdriver to drive self-drilling screws---the screws should penetrate the steel at least 1/2 inch. Layer a scratch coat of mortar with a trowel into the metal lath, completely covering it. The thickness of the mortar layer should be about 3/8 inch. Make sure the mortar stays moist by spraying water over the layer if necessary. Trim stones as needed with the grinder. Place the StoneCraft stones on the scratch coat, starting from the corners first. Wet the back of the stone and the scratch coat with the spray bottle before applying. Butter the back of each stone with ½ inch of mortar before applying. Gently push and wiggle each stone in the mortar to set it in place. Grout areas between the stones where the scratch coat is exposed. Strike the joints (smooth out the joints) with the joint tool when the grout is dry enough to make a thumbprint. Use the whiskbroom to sweep away any loose mortar after the grout has dried. Wear safety goggles when using the drill or grinder. Wear gloves to protect your hands. Don't use acid wash or bleach cleaners on StoneCraft. How do I Tile an Outdoor Exterior Wall?